I’m going to perform an act in which very few special and highly talented people are able to do - foretell the future. These next three words that will come across your eyes, which will then be processed by your brain, will be the next big thing in the music world. Are you ready? All. Man. Kind. In just a few moments your little fingers will be able to drag the cursor down to the YouTube video, which will explain my foretelling, but before we get to the point let’s get some explaining in. 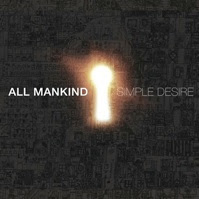 All Mankind debuted their first album, Simple Desire, on October 3, 2011 and we are lucky enough to hear their first single called “Can You Hear Me”. The opening of the track seems positive and bright, which lead to the introduction of vocals that are lightly spoken and makes you stop to think, “Am I listening to Coldplay’s Parachutes?” But, as the track progresses you’ll hear a little more Chris Martin backed by music that portrays The Cinematics and a bit of Airborne Toxic Event at moments. So, you might be asking yourself, “If this here is a band that could be a spitting image of an already immensely main stream band, why would I expect All Mankind to give me something new to listen to?” Here’s why. These guys are already working with Mike Crossey who has worked with Arctic Monkeys and The Kooks. If you know anything about these two groups you’ll expect that All Mankind will follow suit in having the same innate ability to create music that is fulfilling to the ear, gets your feet stirring, and don’t have tracks that sound like a constant repetition of beats that are just tweaked by altering the tempo. AMK is therefore deemed with the ability to do just this but will also make it so that main stream media willingly accepts their work. With MTV already in the process of promoting and familiarizing it’s viewers with their music, there is no doubt in my mind that one day you will be humming “Can You Hear Me” as you go about your life. Now, go ahead and click that little play button and enjoy for yourself. When you’re done listening, leave a comment below and let us know what you think. Will they be big? Or will they fall off the grid?